Thank You to the People Who Make Our High Holy Days Come to Life! 700 Benches: Come and Learn! Rabbi Dev Noily, Senior Rabbi, came to Kehilla in 2010. They previously served as Director of Kehilla School and Associate Rabbi. 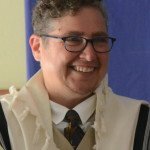 Dev is active in queer Jewish work, LGBTQI interfaith work and intra-Jewish dialogue work, facilitating difficult conversations in Jewish communities about the Israeli-Palestinian conflict.